In December of 2015, Julien's Auctions featured items from the London estate of Ringo Starr and Barbara Bach. This included musical instruments including drums and guitars and career memorabilia from The Beatles era, including his 1963 Ludwig Oyster Black Pearl three-piece drum kit used by Ringo in more than 200 performances as a drummer for The Beatles between May 1963 and February 1964. The drums sold for $2.2 million, plus a 20 percent buyer's premium. 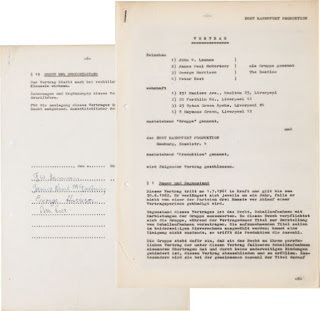 The original Beatles 1961 Recording Contract. Back in November, Swann Galleries in New York City auctioned off highly-prized first editions in magnificent condition. And condition, as the gavel prices indicated, was everything. A first edition of Sir Arthur Conan Doyle's The House of the Baskervilles sold for $8,125. Rex Stout's The League of Frightened Men (1935) sold for five times that amount. But the highlight was a first edition copy of Dashiell Hammett's book, The Red Harvest, from 1929. This book sold for $65,000. A 1930 first edition of The Maltese Falcon, with the original dust jacket, fetched $27,500. These auction items also required a 25 percent buyer's premium. The only depiction of Superman by artist Frank Frazetta, done in 1988, sold for $35,420 at Hake's Auctions in York, Pennsylvania. The same auction house was responsible for the sale of a framed album cover of The Beatles' A Hard Day's Night, autographed by all four members of the group, for $27,781. There was also a 15 percent buyer's premium. Concept art for the 1939 MGM movie, The Wizard of OZ, was sold by Heritage Auctions in August of 2014. (How this auction slipped under the radar I do not know. I would have kept tabs on this one much sooner.) A pair pf pre-production concept paintings from the movie sold for a combined $45,625. You can buy a reproduction movie poster for the 1925 classic, Phantom of the Opera, was an original sells for a lot more. 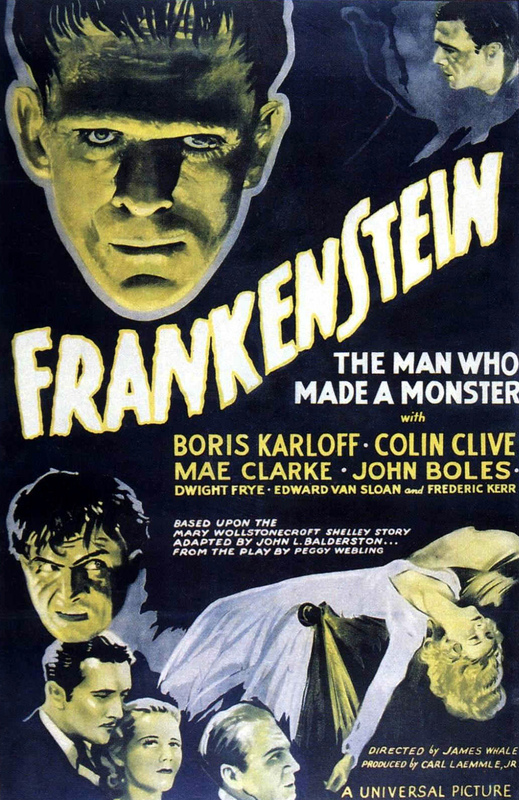 In July of 2014, a rare original one-sheet sold for $203,150 at the Vintage Movie Posters Signature Auction. Charlie Chaplin still commanded value when a six-sheet for Sunnyside (1919) went for $71,700. A poster for Casablanca sold for $83,650. But don't mistake these values as standard in the collecting market. If you find a Casablanca movie poster at a flea market, condition and exactly what kind of poster will make the difference between $5 and $83,650. The only six-foot example of the 1931 horror classic, Frankenstein, sold at the Vintage Movie Posters Auction in March. Gavel price was $358,000. The same auction sold a six-sheet poster for The Maltese Falcon (1941) for $191,200. If you collect toy robots, you might find this of interest. A Jupiter Robot with the original remote control, in the original box, sold for $36,000. 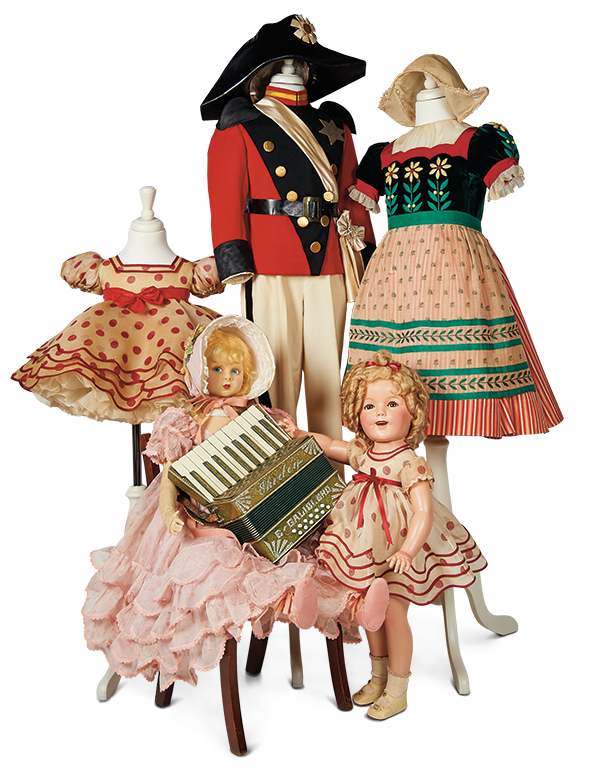 Murphy Auctions in Denver, Pennsylvania, has been known for selling high-grade vintage toys and this was no exception. A Linemar Popeye and Olive Oil tank with the original box went for $16,800. Prices included a 20 percent buyer's premium. You know that the Academy of Motion Picture Arts and Sciences condemns the sale of Oscar statuettes but apparently you can sell a Tony Award. Mary Martin's Tony Award (1959-1960 season) for her performance in The Sound of Music on Broadway sold for $43,750. RR Auction in Boston, Mass. was responsible for the sale. The Tony Award originated from the estate of Larry Hagman, son of Mary Martin. The same auction house was responsible for the recent sale of Ringo Starr's screen-worn jacket from the 1965 movie, Help! which sold for $46,527. Beatles memorabilia was sold at the Entertainment & Music Memorabilia Auction in September, conducted by Heritage Auctions. A 1966 sealed first-state steal copy of The Beatles' "Butcher Cover" of their Yesterday and Today LP, considered mint of the highest condition, sold for $75,000. The very first recoding contract for The Beatles (signed by Lennon, McCartney, Harrison and Pete Best) sold for $93,750. Add to these titles a 25 percent buyers premium. Fans of old-time radio are familiar with the radio program, The Aldrich Family. Whenever a discussion about the radio program is the topic of the minute at radio conventions, Clifford Goldsmith and Ezra Stone are mentioned by name more often than anyone else. But ask someone, "Who played the role of Henry Aldrich's mother on The Aldrich Family?" and no one seems to be able to answer the trivia question. Katherine Raht was brought up to be a Chattanooga belle, and surprised her family by becoming a school teacher after graduation from Bryn Mawr. When she left teaching to attend a school of the theater, her family and neighbors all but swooned. Her first acting plum was the role of Mrs. Gibbs in Our Town. Until she had been chosen for the role of Henry Aldrich's mother, Katherine Raht didn't know she wanted to be in radio at all. Although she always had a yen for the stage, and sang Gilbert and Sullivan operettas in glee clubs, and studied costume design, she never consider the fledgling medium of radio as a career booster. In the spring of 1939, a friend was so impressed with her sympathetic and motherly voice that he introduced her to Clifford Goldsmith, author of The Aldrich Family. Goldsmith was just beginning auditions for his radio program. It appears he heard her several times on small-known radio programs, but when she was paired up with House Jameson (Mr. Sam Aldrich), they made such a team that Goldsmith hired her to play the role. "It was clearly an exception to the rule," Raht later explained in an interview. "Most radio stars come up the hard way. You can't learn anything in two weeks, as I told a certain ambitious young girl who had come to New York from the South and asked me where she could go to learn radio in record time. She wanted to go home a full-fledged staff announcer. She had the cart before the horse." I know of no respectable scholar, University professor or author who consults the internet as a reference, and hanging their head up high, they will tell you so with stern conviction. There's an old saying among researchers: everyone consults previously-published books on old-time radio and copies the same mistakes in their write-ups, but very few actually do the legwork. (One web-site in particular has built a reputation for stealing material from other people's web-sites, then claims they did their own "independent research," and sadly is misleading others into thinking they are "historians.") So why did I bring this up? Because two months ago on Charlie Summers' OTR Digest, I made reference to an episode guide for The Aldrich Family, which has been in the works for some time. Many years, actually. A kind soul (who admitted he has a few of my books and wanted to help contribute to the Aldrich Family project) mailed to me via Fed Ex, two large scrapbooks previously owned by Katherine Raht. Most Hollywood actors do not keep a scrapbook of all the newspaper clippings, Variety reviews or other mementos. Some did, but most did not. But those who worked on the stage during the 1920s and 1930s, often did. Perhaps this rubbed off on Katherine Raht, but regardless of the reason, we now have a very comprehensive document of her stage and radio work. In an effort to preserve the scrapbooks (which were starting to fall apart at the seems) I used my digital camera to snap photos. Using the scanner was not possible since the pages were much larger than the scanner itself. Besides, it's the history and text we want to preserve. As a treat for all you Henry Aldrich fans out there, enclosed are a number of clippings and telegrams and other goodies found within the scrapbooks. Sorry, but I am not including all 200 snapshots. But the samples are something to droll over. You'll probably have to click on each image to see them larger. Be assured that I did create an off-site back up of the digital files so there's no fear of losing them. As for The Aldrich Family project, there's no insurance of a book in the works. At least, not yet. But as a researcher, I don't turn such opportunities down. I'm willing to take time and help preserve what I can of radio broadcasting history. So for the moment, the photos you see are being stored on the shelf until something comes up noteworthy. P.S. If the web-site I mentioned above (or any web-site for that matter) copies the photos and pastes them on their site, thus giving the appearance they originated the snapshots, or go so far as to claim I stole them from their web-site, I'll quietly remove this posting and permanently cease offering future archival goodies. I'm extending a courtesy for the fans, not for credit hogs with huge egos. I finished reading a book this week that you will probably never read. 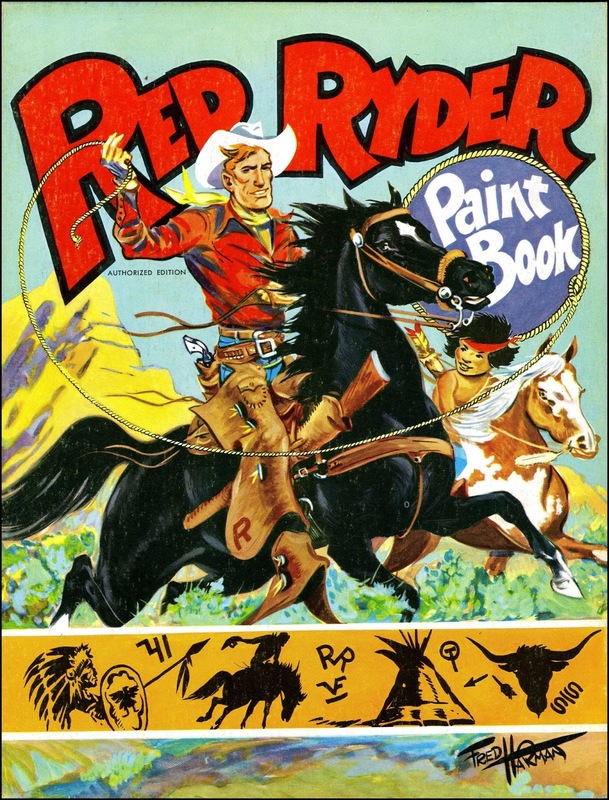 It concerns "America's famous fighting cowboy," the red-haired, red-shirted hero first seen in a series of short stories by writer-cartoonist Fred Harman. The comic strip was adapted into a cliffhanger serial, a series of movies, unsold television pilots, comic books, and a weekly radio program. Red Ryder was a two-fisted tornado who lived with his aunt, his sidekick Buckskin, and his ward, Little Beaver, in the western settlement of Painted Valley. 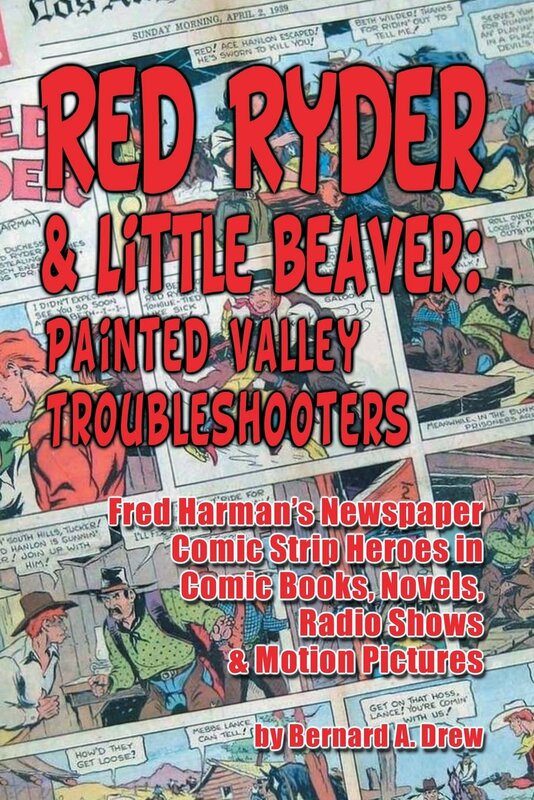 In 2013, Bear Manor Media, publishers located in Albany, Georgia, published a 200 page book titled Red Ryder & Little Beaver: Painted Valley Troubleshooters. The book documents Fred Harman's newspaper comic strip heroes extensively. Having been a fan of Bernard Drew since he wrote two books about Hopalong Cassidy, you can imagine how pleased I was to discover he wrote a book documenting the history of Red Ryder. My curiosity motivated seeking out a copy to buy... and there lies the rub, as Hamlet put it. The book is already out of print and now established with an asking price at least three times the initial cover price. Initially I assumed the adage, "You snooze, you lose" applied here, but there turned out to be a back story behind all this. A short time after the book became available, the owners of the trademarked property contacted the publishing company issuing a formal "cease and desist" letter. Legally, anyone can write a book when the facts are presented encyclopedic in nature. And that is exactly what Bernard Drew did. But there is a difference between copyrights and trademarks and King Features Syndicate, Inc., for reasons unknown, decided the book was not in their best interests. Naturally, the publishing company offered a royalty for book sales, but the company refused them flat. A debate could have been exchanged between both parties -- possibly costing each side unnecessary expense in legal fees. The publishing company weighed the options and decided to pull the book from distribution. The adventures of Red Ryder pre-dates a baby boomer generation and combatting an aging fan base, book sales would not have justified legal expenses. Financially, this would have been a wash at best. Intelligent reasoning could form the backbone of a debate coming from both sides, but the more important problem is evident: how necessary is it for accurate and thorough documentation for preservation sake? This book accomplished that very purpose. From a biography of Fred Harman, the origin of the comic strip, original stories in Red Ryder comic books, documentation about the radio program (more extensive than any write-up found in encyclopedias), how the character changed during World War II, public appearances in rodeo tours and parades, the reason why the television pilots failed to sell, Republic Pictures and the motion-pictures they produced, Little Beaver Town in Albuquerque, the Fred Harman Art Museum... it's all here. Which leads me to wonder why King Features Syndicate, Inc. would not want their property documented extensively? A number of literary pop culture heroes from the past have practically faded away with little -- if any -- interest. Who today can name the actor who played the title role of radio's The Adventures of Jimmie Allen? Who remembers the musical theme of Silver Eagle? Decades have passed with incorrect information about Straight Arrow, claiming he was an Indian masquerading as a white man, now relegated to semi-annual magazine articles to remind people that Straight Arrow was a Comanche Indian who dressed as rancher Steve Adams by day, and served justice against cattle rustlers as Straight Arrow... not the other way around as so many encyclopedias incorrectly state. Sure, you can browse the internet and find historians offering bits of information ranging from details about the comic strips, including publishing dates, scans of the covers of comic books and movie posters. King Features is not making any profit from those websites. Bernard Drew's book could put a little money into the pockets of King Features. After all, isn't that the reason why they retained the trademarks? In another 20 years, The Adventures of Red Ryder will probably fade away and without a comprehensive treatment available at our fingertips, a future generation may know nothing about Fred Harman's much-loved character except what they read in minor write-ups in encyclopedias such as Wikipedia and John Dunning's On The Air (1998). A museum may even consider a display promoting the art and stories of Red Ryder, but exactly what will they have to pull from their reference library for consultation? Extremely few copies were printed and sold before the book was pulled from distribution, so if you are reading this take note: buy your copy today at the lowest price you can find. Five years from now you can brag that what you have on your bookshelf is extremely rare and value. It will certainly continue going up in price over the years. Someone is already offering one for $1,000; thankfully I paid a lot less than that! As for the author, his efforts were not in vain. Authors find amusement witnessing hefty price tags of their own books, after they go out of print. For Bernard Drew, this just happened a lot sooner than expected. 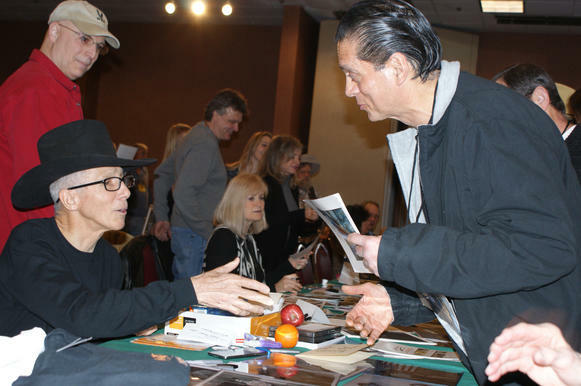 Johnny Crawford from The Rifleman meets a fan. The Williamsburg Film Festival celebrates its 20th anniversary March 9-12, 2016, with guest stars, nonstop western movies, live musical entertainment, and a massive dealer room of multimedia memorabilia ranging from DVDS to vintage toys and comic books. 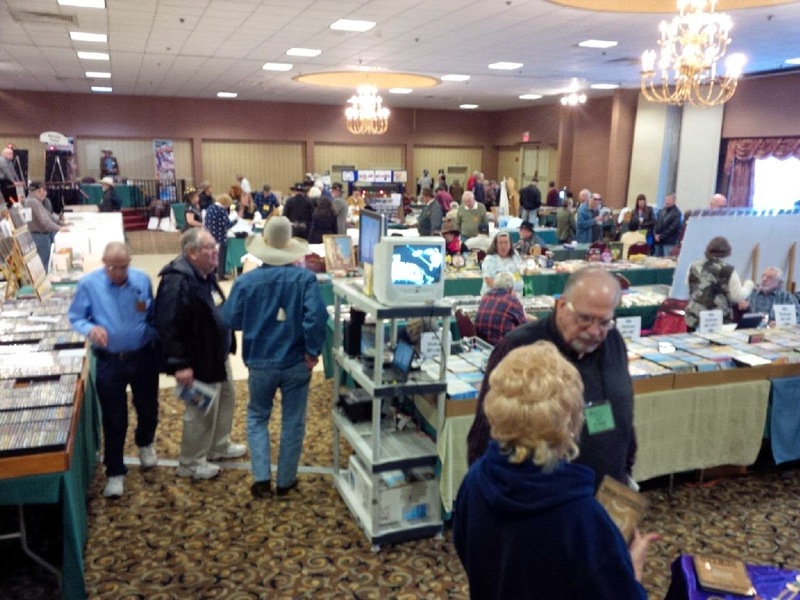 The four-day event takes place at the Holiday Inn-Patriot Convention Center on 3032 Richmond Rd. in historic Williamsburg, Va. Reservations may be made at 757-565-2600 and 800-446-6001. Representing the best of the movie and TV west, the stars will be interviewed in person onstage and appear throughout the event for autographs. They include Don Collier, Audrey Dalton, Ed Faulkner, Robert Fuller, Burton Gilliam, Terry Moore, Jaqueline Scott and Roberta Shore. “We have come a distance,” reports current festival board president Larry Floyd. “We started back in 1987 as a small group of friends and fans from all walks of life that just enjoyed getting together for screenings of the cowboy movies we collected and loved as kids. The group grew.” It did. After a decade of informal get-togethers, the expanded group decided to follow the example of full-blown organized film festivals in Charlotte, Knoxville, Memphis and Ashville. The first official Williamsburg Film Festival took place in 1997 at the Comfort Inn in Williamsburg. It featured celebrities Dale Berry, James Best, Peter Boone, Gene Evans, Will Hutchins and Willie Phelps. The board is all-volunteer and includes retired and current professional men and women – business execs, career military, academicians and techno-wizards, all of them confirmed front-row kids. They work hard to make the Williamsburg Film Festival fun for celebrities and guests alike. There have been plenty of surprises over the years, including at least one big turnout in the midst of a snowstorm. Then there was the time famed tough-guy actor Morgan Woodward (remembered as the stone-faced prison guard in sunglasses who shoots Paul Newman in “Cool Hand Luke”). At the end of an onstage question-and-answer session, he was asked to sing “Danny Boy.” It turned out that he happened to be a classically trained baritone. Woodward stood up and sang the moving Irish ballad impeccably. When he was finished, there was not a dry eye in the house. At the outset of her onstage interview, Ann Rutherford (“Gone With the Wind,” “Love Finds Andy Hardy”) was asked a question about her childhood; she proceeded to fill the entire hour from that moment forward without further interruption. Captivated along with the crowd, the interviewer placed his notes on the floor beside his chair, sat back and listened. When time ran out, the eloquent and engaging actress received a well-deserved standing ovation. Harry Carey Jr. (“The Searchers,” “Three Godfathers”) was a smoker. 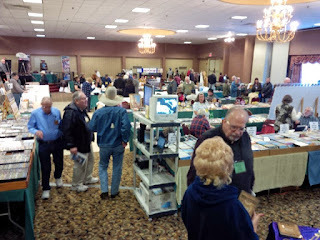 The dealer room was smoke-free, but he discovered a door to the outside and, when needed, could usually be found on the other side of it, seated on some bricks, enjoying a cigarette. One evening an individual in a three-piece suit also discovered that door, to the same purpose. He lit up and, suddenly, spotted Harry. “Are you … Harry Carey Jr.?” he asked breathlessly. Harry looked up and smiled. “Guilty,” he said, and blew out smoke. “Don’t move!” cried the man in the suit, and he ran back inside. A minute later, he ran out again, pulling behind him another man, older but also resplendent in a three-piece suit. “See, Doc?” the first man shouted. “If I had taken your advice and quit smoking, I’d never have met Harry Carey Jr.!" So it goes at the Williamsburg Film Festival, which also welcomes annually the Solar Guard Academy, national fans of Tom Corbett, Space Cadet. Welcome to the 20th edition, March 9-12, 2016. That’s www.williamsburgfilmfestival.org or visit us on Facebook.